Hey y’all! This year I’ve been super slack with blogging, but life happens, and I’ve been a little distracted. Anywho, I was looking for a way to protect my purse handles on my LV Speedy 30 bag because the leather can get so dirty and you have to be super careful with them. So careful that it’s annoying and I rarely carry it. But, I found a way to protect them, and add a cute, stylish look to your bag! I can’t take credit for this idea because I actually saw it by noticing someone else’s bag in a pic posted on Facebook. Then I went searching on eBay to find a cute scarf, and purse handle scarves actually exist! I paid $10 and got two pieces, one for each handle. I only wish I had known this sooner because I could have saved mine from getting a little discolored. There’s also this YouTube video that shows you how to tie them on. I’m going to keep playing around with mine so that the scarf won’t be so long, but I love the look, and now I won’t be so worried about ruining my bag now! 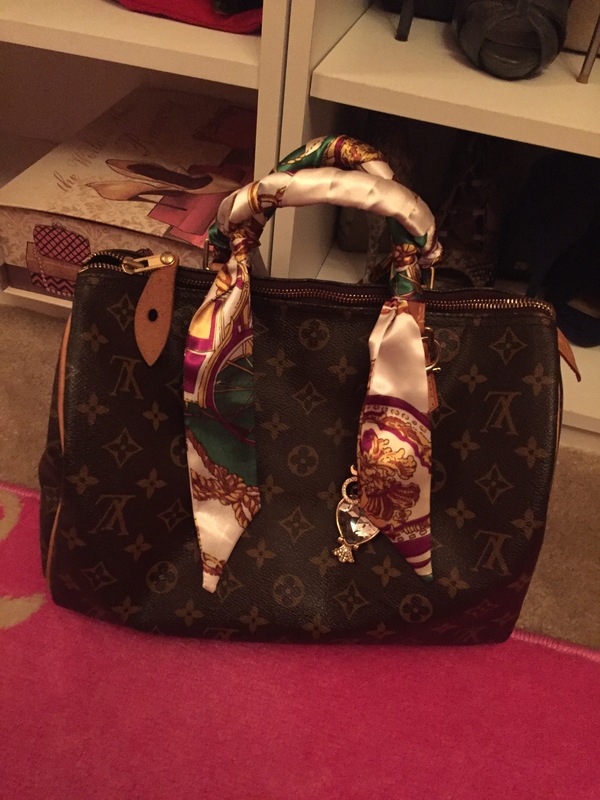 Have you guys found other creative ways to protect your LV bag handles? Hi! I don’t have a link and this was so long ago, it may not be available anymore. But when I was looking I just searched for purse handle scarf and a bunch of results came up. Good luck!